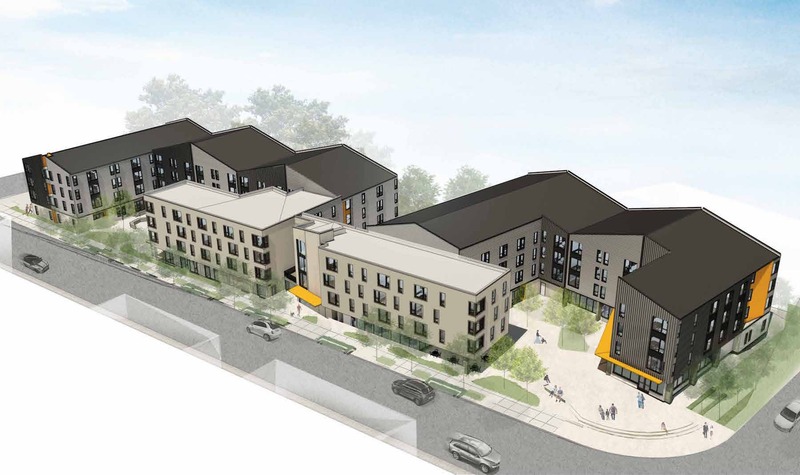 REACH CDC’s Argyle Apartments will add 189 units of affordable housing on surplus property currently owned by TriMet. Every week, the Bureau of Development Services publishes lists of Early Assistance applications, Land Use Reviews and Building Permits processed in the previous week. We publish the highlights. This post covers August 27th to September 2nd, 2018. Construction of ten condo units with garages in three 3-story buildings. Rooftop stormwater disposal via on-site infiltration drywell and paved areas on site to be pervious pavers. Please see EA 18-140413 and LU 18-173926 HR. poor soil infiltration, the proposed stormwater design will use simplified approach size stormwater planters (treatment and flow control). Overflow will connect to combined sewer in Tillamook Avenue. Due to location of adjacent basement and poor soil infiltration, the proposed stormwater design will use simplified approach to size stormwater planters (treatment and flow control). Overflow will connect to combined sewer in Tillamook Avenue. Proposed project is a senior living community with 110 units of R-2 occupancy independent senior living, 131 parking stalls in below grade parking with total GSF of 296,500 with 42,000 of that amount being below-grade parking.Active uses will be provided along 13th Avenue per 33.510.225. those may be lobby, bistro, admin offices, salon or other similar uses complimentary to the community and to development objectives stated for 13th Ave.
Multi-family residential development with 189 affordable housing units, with 5 modifications requested. Every week, the Bureau of Development Services publishes lists of Early Assistance applications, Land Use Reviews and Building Permits processed in the previous week. We publish the highlights. This post covers February 26th to March 4th, 2018. Note that this post previously included some projects that should have been included with the following week’s metro reports. Proposal is for a new seven story mixed use residential and commercial development which includes 144 mixed, 2-bed, 1-bed and studio apartments with ground floor amenity and rooftop outdoor deck, commercial space and one level of below-grade parking. Current code: Proposal is for a 9 unit, multi-dwelling residential apartment building consisting of (9) 3-story townhouses of Type VA-NFPA 13R construction. The ground floor of each unit includes an outdoor room, main entrance, bonus room, garage and trash/recycle area. Tandem spaces are provided in the driveway extension. Current code: Six-unit multi-family development in R1 zone. Site is adjacent to a frequent service bus line. 4 garages are proposed for units 1-4. Access to units proposed through private driveway. Applicant proposing to use density bonus options to increase maximum allowed density from 5 units to 6 units. No changes to site/project due to comp plan & zone map changes: New one-story building for office and manufacturing. Current code: Proposal is for new construction of a four story apartment building which will be approximately 69,500 SF with 76 dwelling units and a new 21 stall surface parking lot. Current code info: Partial demolition of existing Burger King (3,929 sq ft reduced to 3,082 sq ft) and development of a new drive thru pad. Project will include new and reconfigured parking and associated landscaping improvements. Stormwater will be disposed on site via drywells New trash enclosure will be constructed to serve the two new restaurants. New pad is 2,507 sq ft.
New 4 story 63 unit apartment building, associated site work. Overlook – East Building – 68 units over parking and retail space for lease. New 8 story parking garage with ground floor commercial space. Every week, the Bureau of Development Services publishes lists of Early Assistance applications, Land Use Reviews and Building Permits processed in the previous week. We publish the highlights. This post covers January 29th to February 4th, 2018. No changes in code for this site. Total redevelopment of the Kellogg Middle School site after building demolition and site regrading. Includes changes to vehicular access on SE 69th Ave for drop-off/parking and buses, recreation fields, parking and limited access service and fire land connected to SE Franklin St. Proposes 105.112 SF structure at an increase from the former 96,973 SF. Current code: Construct a 3-story, 22-unit, affordable housing project (9,600 sq ft) that is 100% affordable to renters earning at or below 60% of area median income. Current code: Renovation of existing warehouse with addition of interior mezzanine/2nd floor for use as creative office space. 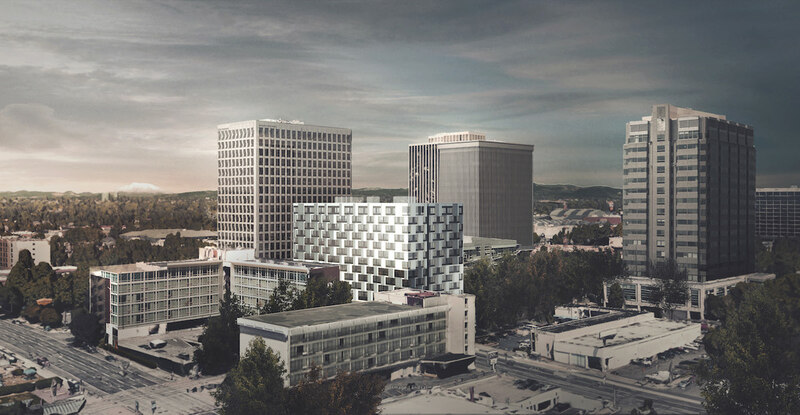 Current code: Project is a 19 story, 120,000 SF business hotel with 486 rooms. Ground floor will have a lobby, breakfast area, business center and other facilities related to the hotel. 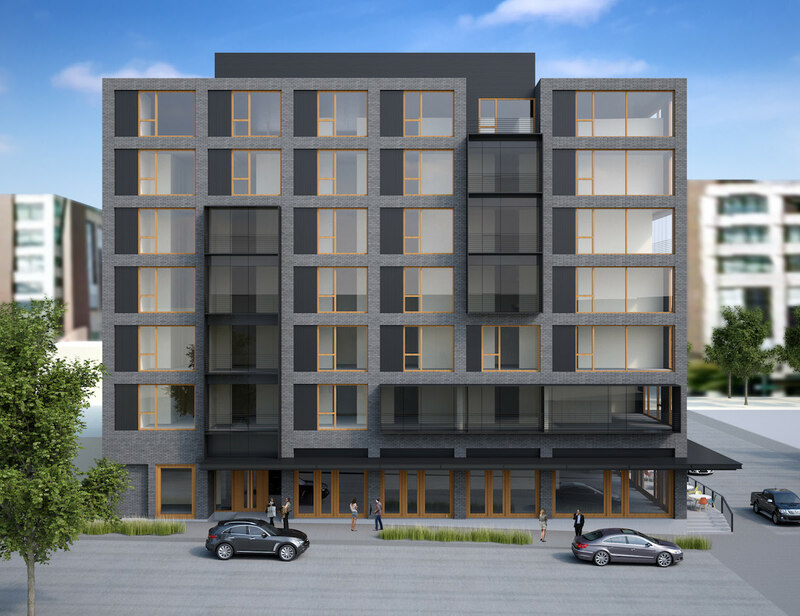 An interior courtyard will include two loading bays, bicycle storage and outdoor dining.Site is subject to an obligation to provide underground parking for the abutting garage building. Current Code: Demolition of an existing one story auto servicing center to be replaced with a new 8-story, 140,000SF commercial office building with retail use on ground level and two levels of parking below grade. 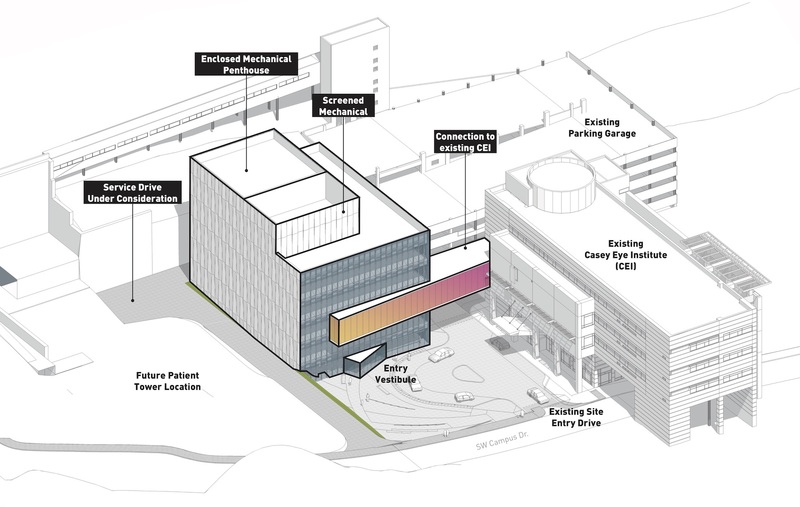 New 5-story building for the Elk’s Children Eye Clinic for OHSU. The Theory 33 Flats will include 30 residential units over ground floor retail. 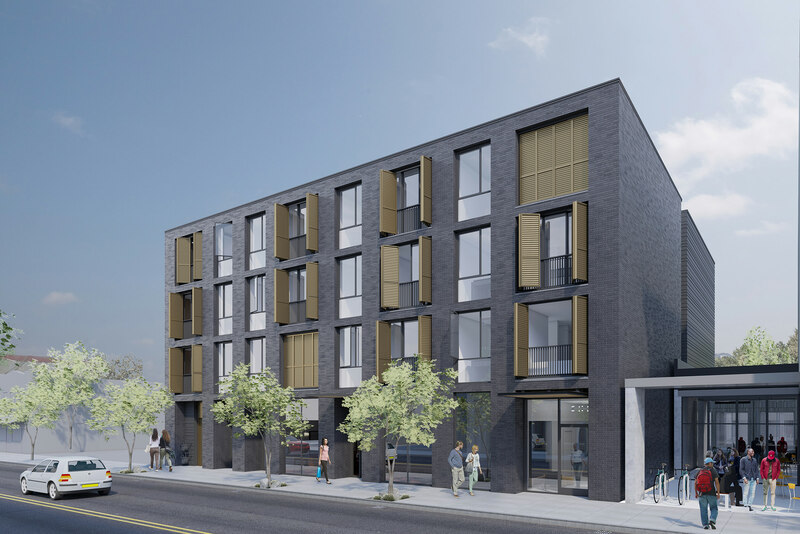 Proposal is to construct a twelve unit apartment building with one and two bedroom units alongside a pedestrian passageway and a central stair to the upper units. Concept development from building at 686 SE Spokane St. The existing structure will be deconstructed by a certified deconstruction contractor. The applicant wishes to use Community Design Standards and wishes to confirm that a Type II Design Review will not be required. Applicant will use current zoning code for review. Current code. 32 unit housing constructed within an existing office building. no additional square footage proposed. Existing parking and site to remain. Project is intended as affordable workforce multi-family residential development. This project includes 3,500 square feet of resident service/community space and 164 apartment units. Proposal is for a 18 unit, three story with basement apartment building with ground floor commercial space. Current code. 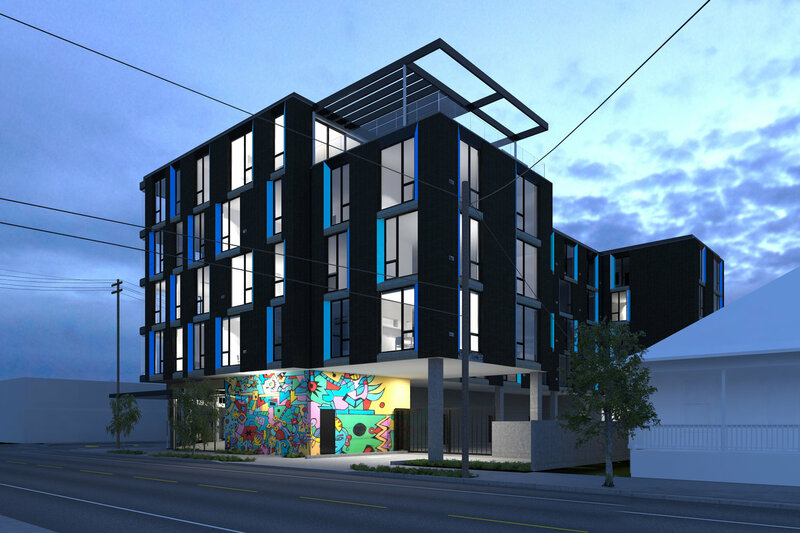 Request for a Pre-App for a Type IV and Type III land use review for one contributing structure (416 NW 5th) and non-contributing structure (430 NW 5th Ave) for a proposal of a new 14 story, 150,000 GSF mixed use residential development with parking. Stormwater disposal via landscaped planter. 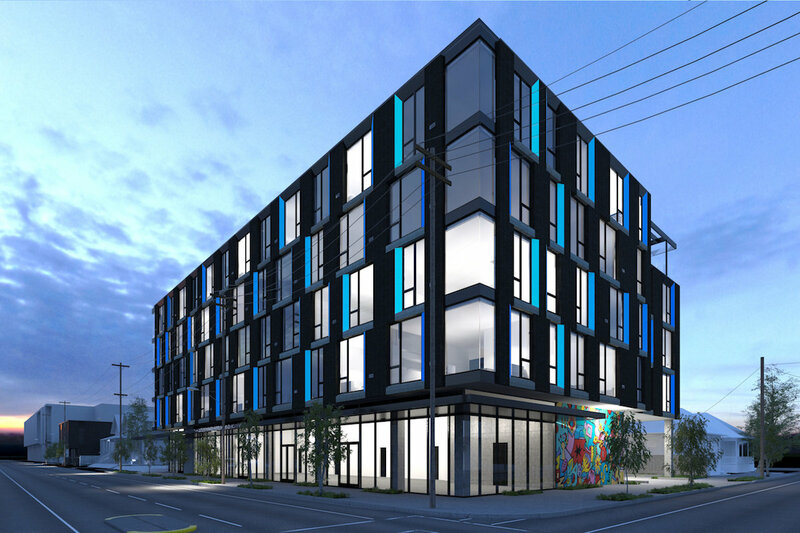 Current code – The project entails demolishing the existing 14,243 sf building & constructing a 20,053 sf market. Stormwater disposal will be dispersed to the adjacent landscape planters/bio filters. Current code – Construction of a two story 8 unit apartment building. Stormwater to be diverted to an onsite drywell. Trash and long term bike parking is located along the east portion of the property. He would like info on both current code and future code. Please note that this “site” is for the pier which is approx 375′ NE from the parcel this case is “built” on (the parking lot parcel: R540254).Convert existing pier (formally part of “Terminal 1”) into a terminal for river-related activities: floating hotel, watersports, seaplane terminal, spa, park, farmers’ market, and/or other amenities beneficial to adjacent condos and apartment buildings. Parking provided by adjacent parking lot, accessed by greenway trail. They propose to bring in a floating vessel to use for above-proposed activities. (Central City Design District. Central City – River – North Pearl Plan District, Guild’s Lake Industrial Sanctuary). Develop multi-family apartments – 18 units planned. Two car garage. Site is a non-contributing structure in Alphabet Historic District. A Pre-Application Conference to discuss an addtion to a church. 2,862 square feet of floor area will be added to the existing 6,814 square foot main church building .The number of parking spaces will be reduced from 171 to 168. The size of the church sanctuary will not be increased and can accomodate 200 people. The fellowhship hall and day care buildings are not expanding. Current code – Looking to create a Net Zero neighborhood community with 37 to 40 units that will have a mix of detached and attached units. Connected greenspaces will be thoughtfuly provided for children to play and community gardens for neighborly connections. Two plans submitted and plans include the following assumptions water, storm, and sanitary sewer connections. Review is for 2018 code changes. Remove the grocery-only condition and redevelop the site with an economically viable use that is compatible with the neighborhood (CM1 zone). New 3 story apartment building with below grade parking. Current code. Construct (2) 4 unit apartments buildings on site with existing single family residence. Shared kitchen, living space, and bathrooms. New Zoning Code – Proposal for a new mixed use, 4 story, multi family building approximately 37 units. New 3-story condominium in need of adjustments: building setbacks (33.120.220.D) and building coverage and pedestrian standards (33.120.225). Please note that the building permit will be applied for next week. REMODEL EXISTING BUILDING – Remove 2 walls of existing 1 story building and develop a 2 story building with roof top space. Building will retail, restaurant and event space. Looking to meet plan district standards. Two 4-plex buildings (8 units) with access in rear (corner lot). No affordable housing. New single story 6200 sq ft building for retail use, with 45 parking stalls on existing vacant pad. Please see 2015 EA (15-250140). 2855 sq ft (60-seat) quick serve restaurant with drive-thru. Proposal is to demolish the existing structures and construct new 4,520sf mini-market and a new 2,970sf canopy over a new quick vehicle service facility with four (4) dispensers. The existing underground storage tanks will remain. New piping for petroleum products. Fueling facility will provide eight (8) vehicle fueling positions, as it does currently. Follow up EA – with planner only (Jason) to confirm that this project will meet Community Design Standards. Please note – this is a PHB funded Affordable Housing Project which consists of 70 units of affordable housing (100% of project). Proposal is for developing a new academic building and would like to update its impact mitigation plan (IMP). The univeristy would like to explore its options under the existing IMP as well as the new campus institutional (CI) zoning district. Looking at purchasing the northern section of this lot to build more units and possibly “connect” it with their current development on R109424. See CO 15-170799. New construction 3-story multi-family development comprissed of (12) units. This is not affordable housing. (9) standa4rd parking spaces are provided and (31) bicycle parking spaces. Solar arrays are proposed for south facing roof slopes. Developing three lots with five duplexes, one tri-plex, and one four-plex. The existing single family home to remain. Also constructing a water quality facility in public ROW, which is in the “c” overlay. Please note there has been a Public Works Alternative Review for this development (see PW 16-122770). Construct new 3 story, 5 unit apartment building, no parking, includes associated site work, sloped lot 6/7/2016 a johnson: note that plan set shows address as 644 SW Grant, which is about 1 mile from 702 sw broadway. Emailed permit-tech for clarification/correction. New 3 story 40 unit apartment building, site improvements, stormwater facility, and 21 stall parking lot. Alterations to smart park garage that include replacing existing stairways/elevators, new signage and awnings, reconstructed enterances and row encroachments. Green roofs are under consideration for new areas. 4-story apartment building with ground floor retail and at grade parking. 3 stories of studio and 1-2 bedroom units. New 16 unit building with pervious pavement and drywells for storm water runoff, 9 parking spaces in a garage and 7 spaces on private street. Seeking to meet Community Design Standards. Proposal for 153 units of affordable housing supported by home funds issued by PHB. The project is made up of two four story buildings with on-site parking to residents. Proposal is to construct 98 guest room four story wood frame on-site parking suites hotel with pre-prepared breakfast (ho restaurant) on existing red lion hotel site. Remove existing 68 room red lion hotel annex in proposed construction area. Proposal is for 7 story use building with 163 studio and one bedroom units over ground floor retail. 75 feet tall. Construction type is 5 levels of Type 3B over 2 levels of Type 1A. One level of below grade parking with garage access from SE Alder St. Conversion of motel to apartments. Minor changes include: New walls, doors, lighting, paint, signage, and new finishes. Proposal is for a 60 unit multi-dwelling structure in the CG zone. Additionally, in the R2.5 zone proposal is for 11 attached dwellings. Proposal is to demo floors 1-5 and basement and renovate space creative office space with ground level retail. Scope includes limited facade renovations to accommodate new retail entries on 5th and 6th and updates to alder st facade. New restrooms to be included. Historic elements to be preserved. Proposal is for new construction of a 260 unit, 16 story affordable multi-family student apartment building. Proposal is for new constructin of a four story office building with ground floor retail and below grade parking behind retail. Review also includes two modifications to building are and setbacks. Proposed 3 story apartment building with partial 4th floor, 62 units with common areas and circulation, 17 car parking spaces behind the building. New 6-story mixed-use, group-living facility that includes parking, shared resident amenity spaces, and 240 living units. Demo Existing Building, provision of a new 7 story office building with retail, service and traditional office. Project will include 2 levels of below grade parking with some at ground floor. 5-story, mixed-use, group-living facility that includes shared residential amenty spaces and 84 living units. Proposal is for a 7 story mixed use building. The proposal includes 58 residential units and ground floor retail. The proposed height is 75 feet. 89 long term and 5 short term bike parking stalls. New 5 story mixed-use building. Ground floor commercial and parking with 87 residential units above.